Instantly batch rename files and folders. Rename multiple files using mp3 and photo tags, numbers, dates, letters and more with this batch file renamer. The instant preview in this batch file rename utility lets you rename quickly. Instantly batch rename files and folders. Rename multiple files using mp3 and photo tags, numbers, dates, letters and more with this batch file renamer. The instant preview makes it a breeze to rename quickly. Change the created and modified dates of files in this fast batch file rename utility. Drag drop and rename thousands of files instantly. Save actions for later use. And get an immediate constant preview every single step of the way. Features include the ability to see internal information about every file and all of the JPEG, MP3, AVI, RAW and AAC file information using this batch file renamer. 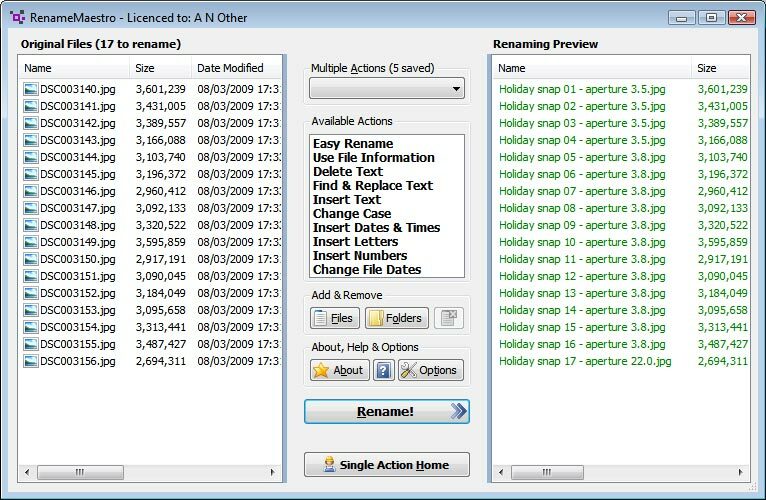 The easy renaming file action lets you create numbered files quickly, if you want to keep the orders in file numbers just select the magic numbering box when you batch rename files. You can add dates and times in your chosen format, increasing or decreasing for each file if you like. Or add numbers and even letters that increase or decrease in the same way in this easy rename utility. Change the created, modified and last accessed dates of files and folders with ease. And RenameMaestro will never rename your files until you're ready. If you save your actions, just import and reuse them again and again whenever you like.